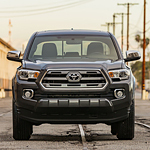 The Toyota Tacoma not only looks strong and rugged, but it also has the components under the hood to back up its reputation as a leading mid-size truck. You can check out what the Toyota has to offer in terms of capability and interior features. If you have a lot to bring with you, a Tacoma could be the right choice. When you combine the 3.5-liter V6 engine with the available tow package, you can haul a maximum of 6,800 pounds. The truck has a lot of stability because it's built with high-strength steel. This particular type of steel alloy is strong and lightweight, giving it the best of both worlds. It's just another reason why so many with work to get done have turned to the Tacoma. Want to get behind the wheel of a Tacoma? Head over to Toyota Of Plano.